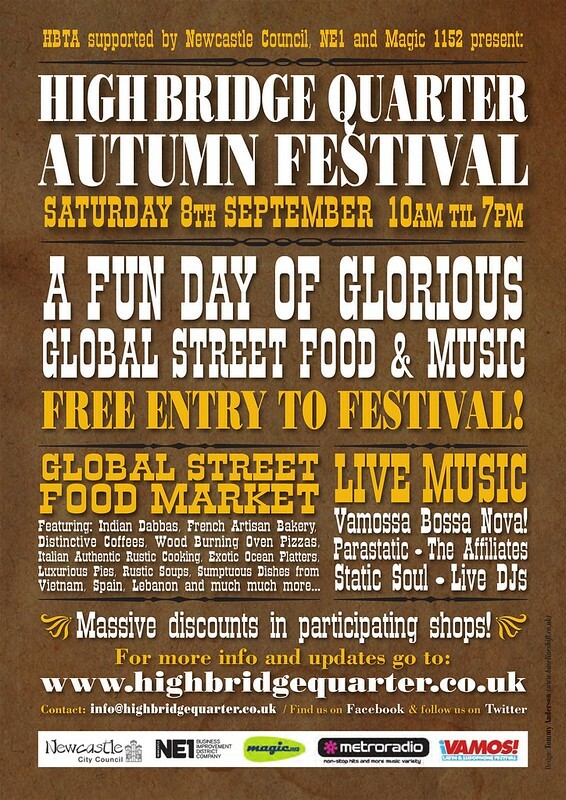 This Saturday, 8th September, Newcastle’s High Bridge Quarter will be in fiesta mode with the second High Bridge Festival this year. The first festival in April more than doubled footfall into the High Bridge Quarter and the hope this time is to smash this record. There will be lots of activities in the Quarter to tempt the crowds including live entertainment from music bands and performances from teams of break dancers, as well as stalls selling international street foods from restaurants including Marco Polo (Italian), Vietnamese from Little Saigon, Indian from Dabbawal, French Oven’s artisan bakery and New Zealand gourmet pies to name but a few. The High Bridge Festival is a truly family affair with lots of activities for children including face painters and art workshops. Outside of BALTIC’s new sister gallery, BALTIC 39 on High Bridge there will be the chance for kids and their families to explore fun and original ways to learn more about contemporary art. Young artists will be able to create their own masterpiece to take home with them. All street entertainment will be free. For more information on this release, for interviews and photographs please contact Sara Ragan, garagepr@btinternet.com or call 0754 0 059 763.